Trying to find food bliss one bite at a time. We are all familiar with the tale of Charlie Bucket. The lucky child who finds that last golden ticket to visit the magical and mystical factory of one Willy Wonka where chocolate delights abound. Saturday I was the proud recipient of a ticket given away for Winnipeg’s First Annual Chocoholics’ Buffet held on behalf of the United Way of Winnipeg. I entered the giveaway located on their Facebook page and was delighted when I received the notification that I had won my very own golden ticket to chocolate delights. Held in the beautiful Ballroom of The Gates on Roblin the first thing I noticed when I entered was the long table in the centre of the room that was already laden with, what turned out to be, only some of the offerings for the evening. To the left of the entrance was the Lindt Chocolatiers table teeming with truffles ready for the sampling. To the right an espresso machine set up to create hot chocolate or a mochaccino to order. For a flavour boost a splash of Triple Sec added hints of orange to your beverage of choice. My Hot Chocolate- sans Triple Sec- ready to be sipped as I survey the room. With hot chocolate in hand I took a walk around the room and noted the many different chocolate offerings that ended with the chocolate fountain surrounded by sliced fresh fruits ready for dipping. I will confess that as I went along I started a mental list of items that I was going to enjoy when I finally got to go through and select my choices. I will also confess to skipping dinner in order to have room to enjoy my fill. This shot is only half of the buffet table as seen from my seat. It was at this point that I came across my companions for the evening. A big thank you to them all for helping to shape my overall experience as often social eating is as much about who you share the experience with as much as the food so thank you to all my table mates, your conversation and impressions added to my enjoyment of the evening. First pass through the buffet provided this array of tastes. After the ribbon cutting I had my first close–up experience with the buffet itself. It was a sight to behold being near so many different styles and interpretations of chocolate desserts. 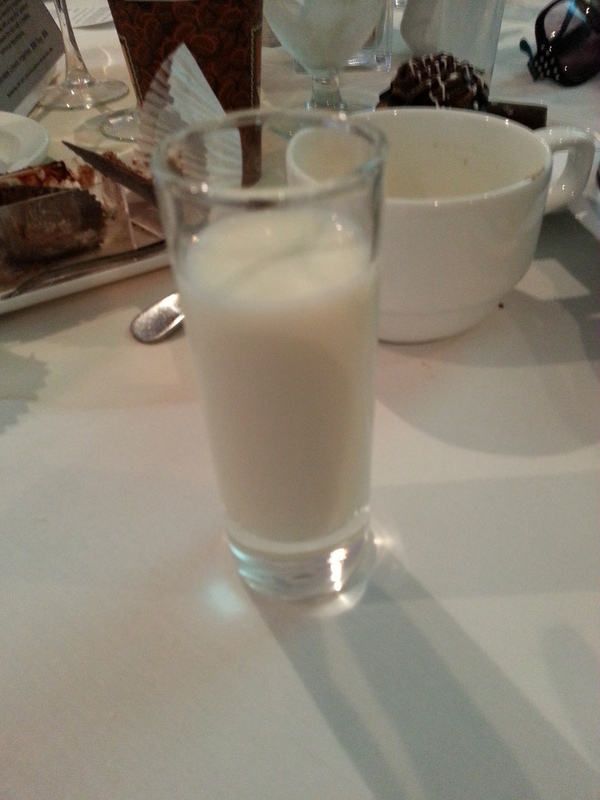 After we had settled in with our first selections we were treated to ice cold milk shots which made the perfect accompaniment for all of our rich bites. My table companions agreed it was a welcome palate refresher and we were asking for more as the evening went on. I want to say I could name every item, but the sheer amount of offerings from so many talented culinary artists still causes my head to swim,even 24 hours later. I can tell you that I didn’t have a bad bite all evening. Everything I tasted was amazing,be it a slice of cake, cupcake, truffle or chocolate. I am already planning to attend the event next year with my husband, as he enjoyed the tidbits I got to bring home in my provided take home box. For a list of all the Chocolate Artists and their offerings please click here to head over to The Chocoholics‘ Buffet. Also take a moment to click here for the Chocolate Artist Spotlights to learn more about who they are and where you can get your own bites of their work. Be sure to peruse the list of amazing sponsors some of whom used their business savvy to support and promote this event. Finally Congratulations are in order for the planning committee for their visionary event. I am still trying to explain the whole experience to those who have asked me about it and while I am not often at a loss for words I find I can’t convey the whole experience. All I can say is…you have to experience it for yourselves. 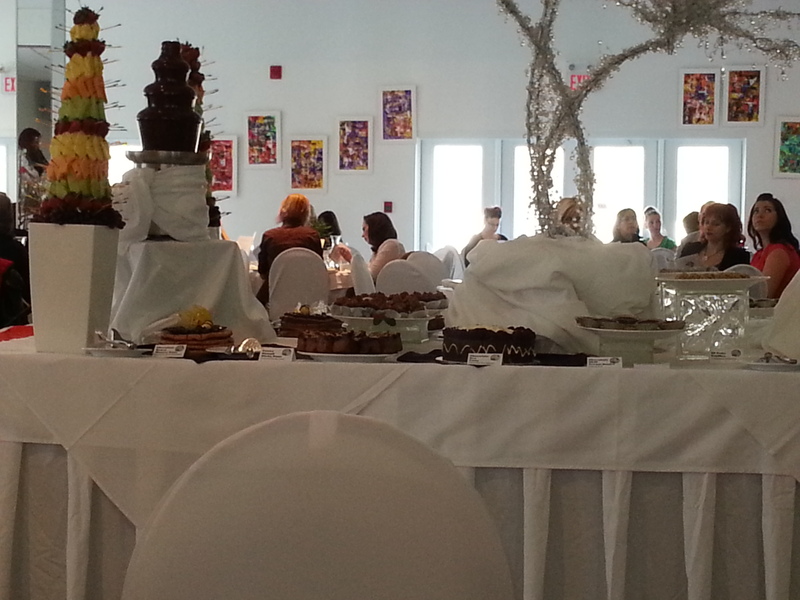 Sunday December 1st, 2013 – Tickets for Winnipeg’s 2nd Annual Chocoholics’ Dessert Buffet will go on sale! 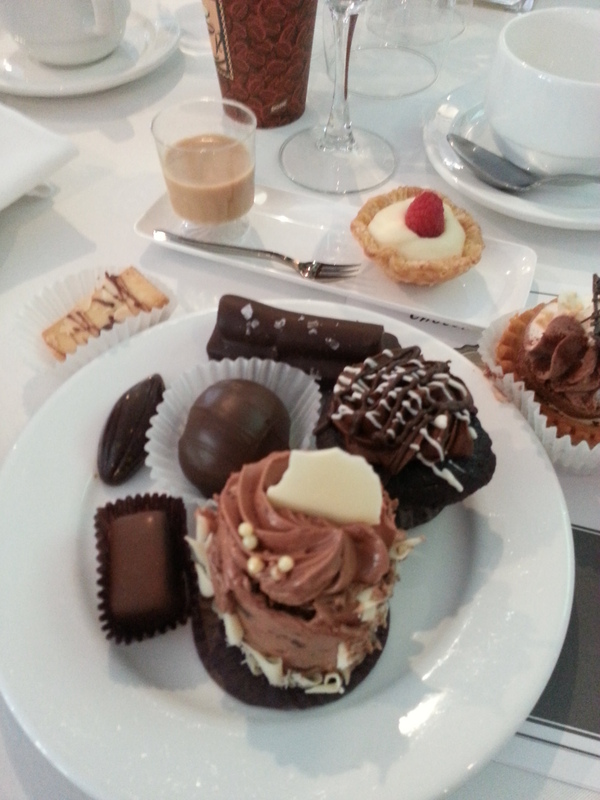 Saturday March 22nd, 2014 – Winnipeg’s 2nd Annual Chocoholics’ Dessert Buffet will be held! I want to start this blog saying that I am thrilled to be featured for this recipe at The Chocoholics’ Buffet today. This amazing event takes place on April 20th, 2013 at The Gates on Roblin and proceeds raised will benefit The United Way of Winnipeg. I, personally, can’t think of a better way to help out a great cause. Be sure to wear your loose pants and pick up your tickets here. Chocolate. They say that just eating is enough to stroke the pleasure sensors in your brain and create good feelings. Irish Cream. Something I enjoy in my coffee or on ice but not something I’ve ever worked with beyond a nip in my evening cappuccino every so often. I’m not so completely out of the loop that I don’t know that the makers of Bailey’s Irish Cream have recipes featured on their website but while I’ve browsed I’ve never made any of them. However, into my hot little hands this week came a bottle of White Chocolate Irish Cream from Shannon’s and I was reflecting on my Triple Chocolate Bribe brownies about getting more than one version of chocolate into a recipe and decided that I would do the liqueur proud and use it in a chocolate cake. When I was younger I had managed to bake the perfect (in my dad’s opinion) chocolate cake. It was so moist and I’ve never been able to attain it with any cake I had tried since then. 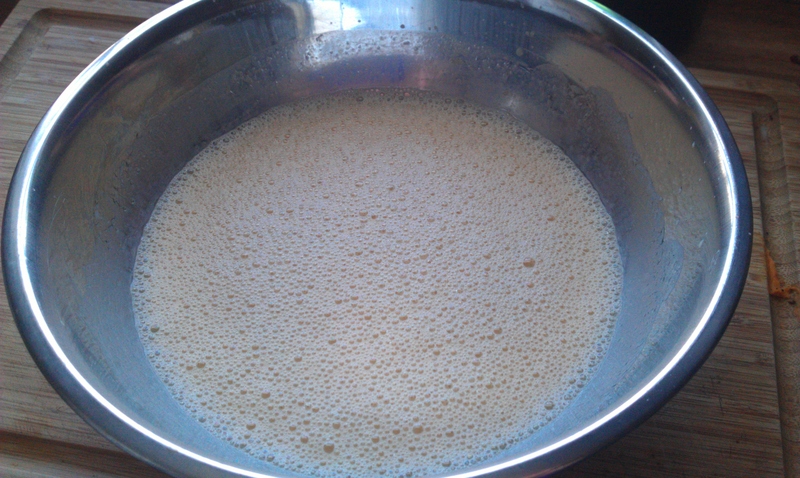 1) I decided to use buttermilk. I’ve been using it in items such as muffins, quick breads, pancakes and french toast for a while. 2) I put in a cup of coffee. 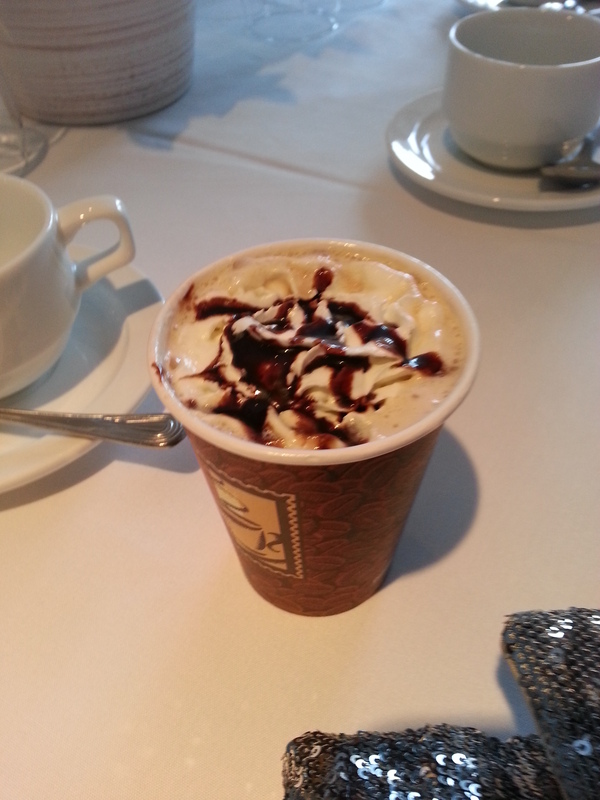 I like how coffee can add to the overall flavour of chocolate as evidenced by the mochachino. 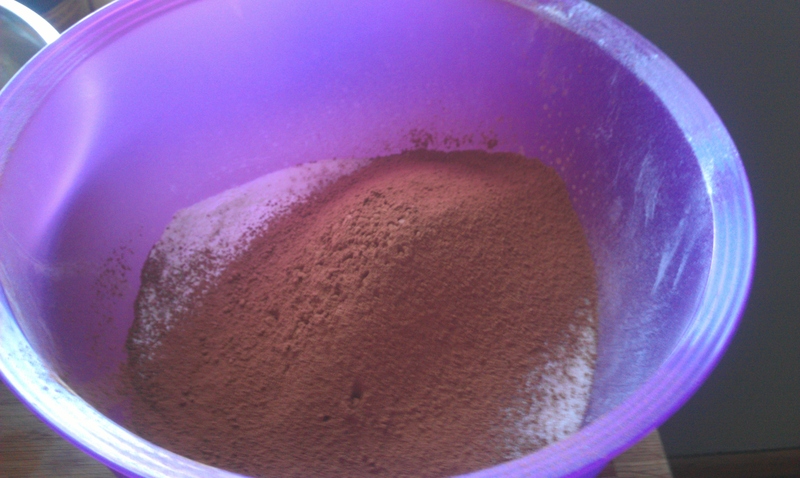 Cake ingredients (from left): Bowl of dry ingredients for sifting including: flour, sugar, cocoa, salt, and baking soda. Then Shannon’s White Chocolate Irish Cream, coffee, oil, egg and buttermilk. Now on reflection of my ingredients I’m thinking about the next time I make this cake using Half Pints Brewing Stir Stick Stout in lieu of the cup of coffee I put in. Stout is known for adding very deep flavour to chocolate desserts and I think would play well with the Irish Cream. I can’t wait to experiment with this idea in future. Dry ingredients. Sifted and ready to go. Sifting is one of my favourite parts of baking. It is simple, effective and doesn’t require a lot to get good results from it. All you need is a metal sieve and to shake the ingredients through until finished. Here you are wanting to sift through all your dry ingredients. Wet ingredients whisked together and ready to go. Getting the wet ingredients ready provided a good learning moment for my 9 year old son. Earlier yesterday he made eggs for the first time and while I was instructing him I discussed with him the value of cracking an egg into a cup so you can check it for blood spots. He managed to make 6 eggs with no issue (for himself, his brother, his sister and for me) but when I cracked the egg for this cake there was a good example to teach him what he was looking for and a talk about how if I had just cracked it into the bowl of wet ingredients that I would have had to start over again because my whole wet component would have been tainted. 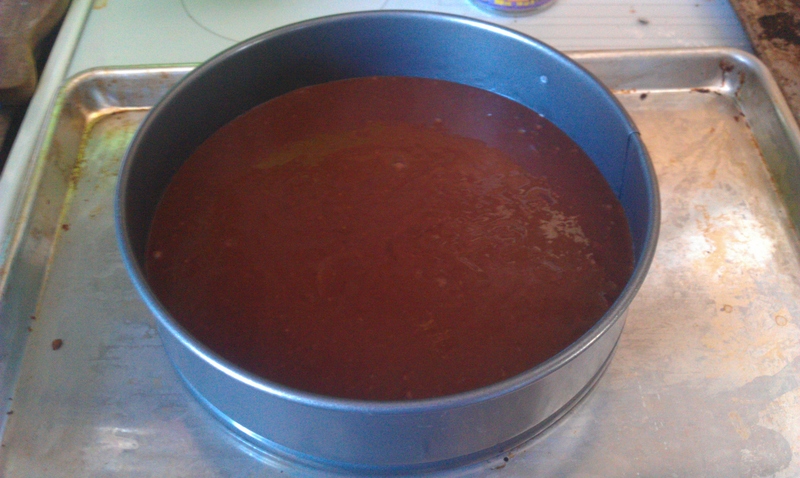 Batter finished and ready to be baked. Adding wet to dry I whisked the batter together. I like to use my whisk when my hands are up for the task because I feel like I can get at the sides of the bowl a bit easier. I used my spring form pan for this cake because once you take the collar off it can be ready to be iced almost as is. I will confess that idea I got from reading online. Into the oven and after about 40 minutes I’ve gotten a cake that comes out clean when I check it. However, as you can see I’ve lived up to my name as something is not completely right with my centre. As I was going through my ingredient list for the photo I noticed that I failed to use 1 tablespoon of baking soda. Instead I only used 1 teaspoon. In the end it didn’t cause any issues with the overall end product but I can’t help but wonder if it would have at least been more esthetically pleasing. So let me take a moment to say…it pays to not rush and to really read before measuring out those dry ingredients. Luckily despite this mishap the flavour held up well and once iced the cake looked great. 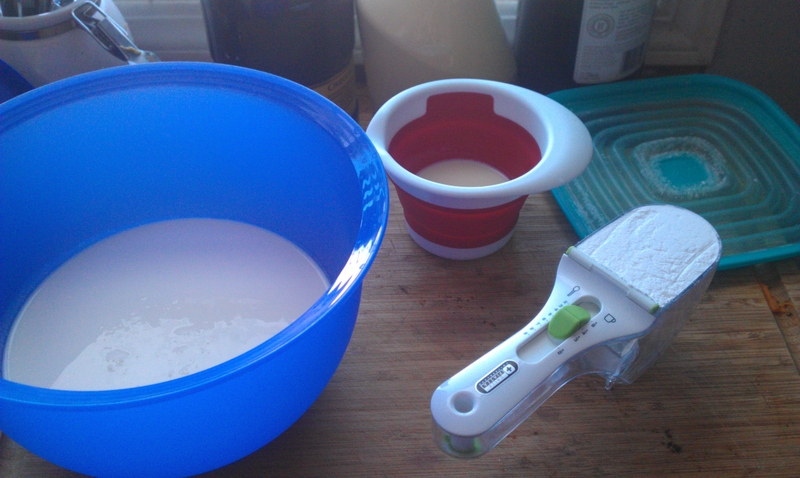 Ingredients for the icing (from left): Heavy whipping cream, Shannon’s White Chocolate Irish Cream and powdered (icing) sugar. I got the idea for this frosting from my aunt. She tops a gingerbread cake she makes with a nice dollop of whipped cream and I decided to go with that inspiration. A very simple combination of ingredients make up this frosting. The cake itself is very rich and a heavy frosting would make it too much. In my opinion, sometimes with frosting less is more. This ended up being almost like the whipped cream on top of your hot chocolate. I also love the simplicity of this frosting. 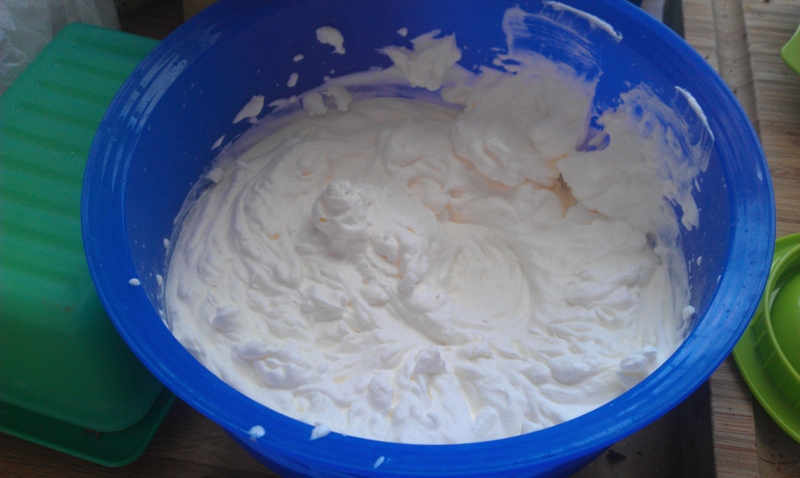 You put all your ingredients together in the bowl and use your electric mixer until you have stiff peaks. It works well in a piping bag or in the decorator from Tupperware that I have mentioned before. 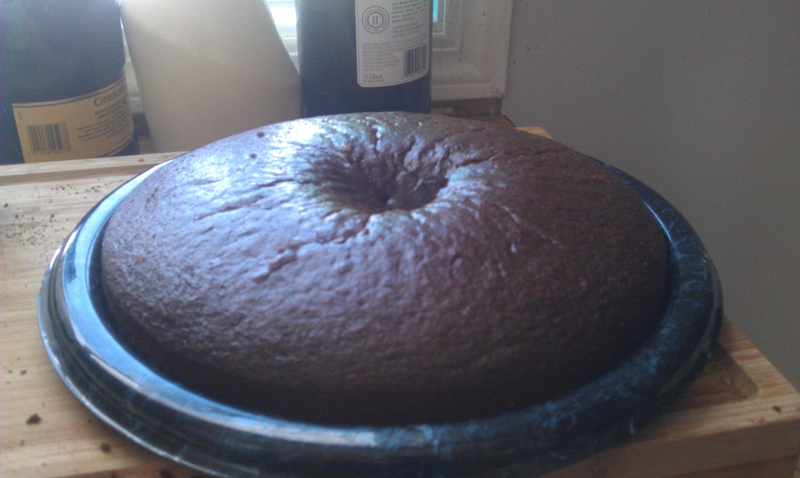 As you can see….dimple in the middle is wonderfully hidden by my frosting. I also decided to play a bit with the frosting and use a star tip. I have come to the realization that I do need to work on frosting skills in the future :D.
Sift together flour, sugar, cocoa, salt and baking soda. 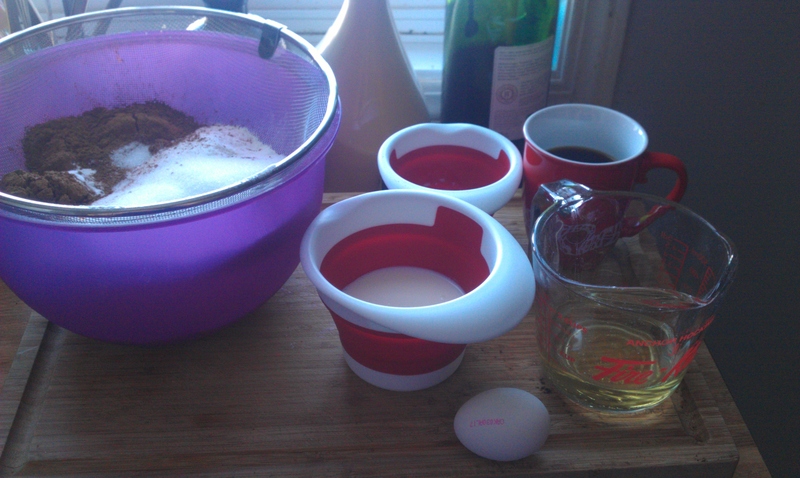 Whisk together egg, oil, buttermilk, 1/4 cup Irish Cream and coffee. Add wet ingredients to dry and whisk until everything is combined. Be sure to scrape the side of the bowl as you are whisking. 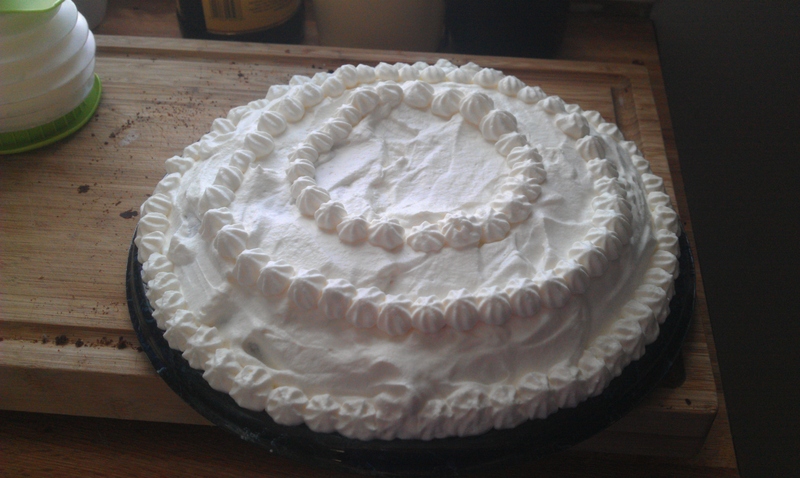 While cake cools combine 2 cups whipping cream, 1/4 cup powdered sugar, and 1/4 Irish Cream in a bowl. Use your hand mixer to beat them until it forms stiff peaks. Once the cake is cool, remove the collar from the cake pan. Frost with the whipped cream frosting. Again if you are in Winnipeg on April 20th be sure to get your tickets for The Chocoholics’ Buffet. Thank you Anna Coleshaw-Echols of Lunchfor1.com for the opportunity to be featured today.